This semester (Spring 2019), I have been taking a class titled “Philosophy of Quantum Mechanics” taught by Nina Emery at Mount Holyoke College. In this class we examine some of the strange phenomena seen in quantum mechanics and discuss the philosophical interpretations of this phenomena. During the first portion of the class we talked about two odd phenomena known as the Two Path Experiment and the EPRB experiment. Both of these experiments exhibit surprising results that stun physicists to this day. In particular, the results of the EPRB experiment exhibit a perfect anti-correlation, which has surprised physicists for decades and deserves an explanation. Many have attempted to develop theories to explain these bizarre results and interpret their implications, including Einstein and two of his grad students. The three of them came up with a theory known as “hidden variables theory”, which in short, explains the perfect anti-correlation seen in the EPRB experiment using a common cause explanation. John Stewart Bell responded to this by developing a theorem known as “Bell’s Theorem”, which states that it is mathematically impossible for one to hold two assumptions, known as no conspiracy and locality, and allow hidden variables theory to be true. This leaves everyone with the dilemma of either giving up one of these assumptions or to not accept hidden variables theory and make another attempt to explain the perfect anti-correlation. This paper that I wrote for the Philosophy of Quantum Mechanics class argues in favor of giving up the locality assumption. I argue for this response by explaining the EPRB experiment, hidden variables theory, and Bell’s theorem, and then making an argument for giving up the locality assumption in Bell’s Theorem. Lastly, I give a possible objection to my argument and explain why this objection is unconvincing. This past summer I completed my second research project as an undergraduate at Mount Holyoke College. This summer I worked with Spencer Smith in his lab at Mount Holyoke where we use mathematical and computational methods to explore the behavior of fluid systems. There are a few different projects worked on in his lab, which I spent some time exploring during the Spring 2018 semester before beginning this project over the summer. During the Spring 2018 semester, I also took a course taught by Spencer titled “Themes in Physics and Art”. In this course we explored the intersection between physics and art by looking the role that physics plays in artistic media and composition, as well as discussing how physics can be an inspiration for art. One of the units of this course had us studying the art of paper marbling, and how this particular artistic medium is highly dictated by physics, particularly fluid dynamics. During this unit, Spencer invited a couple of professional paper marblers who have a studio in Amherst MA to come in to our class and give a demonstration on paper marbling. Everyone in the class was fascinated by the process of paper marbling, as well as the beautiful patterns that emerged from it. Feeling inspired by this course, I decided that I’d like to use my time during the summer to study the intersection between physics and art more in depth. Soon after discussing this with Spencer, he came to me with the perfect project to meet this goal: the paper marblers who came in to our class showed an interest in working with us to study the physics behind the art of paper marbling, and would allow us to come in to their studio to conduct experiments. This proposal was really exciting to me, so I agreed to participate in this project. During the spring semester, I also developed an interest in fractals, and wanted to incorporate them into my summer project. After doing some background research on fractals, I noticed that many of the marbling images we looked at appear to have some of the properties that fractals have, particularly the self-repeating property of fractals. This inspired us to analyze these marbling images by examining their fractal properties. Throughout the summer, Spencer and I worked on developing a program that analyzed the fractal properties of an image, particularly the fractal dimension, that would be used on the images we create from paper marbling. We also spent two days in the paper marbling studio creating images by experimenting with the viscosity of the solution the paints are dripped on to, and the number of times we drag a comb through the paints. The result was a collection of beautiful marbling images, most of which we ran through the program that was written to analyze them. The result of this project was the conclusion that the images created from paper marbling do have fractal properties to them. From this project, I created another research poster which I presented at the Mount Holyoke College SPS Summer Research Poster Session in September 2018. 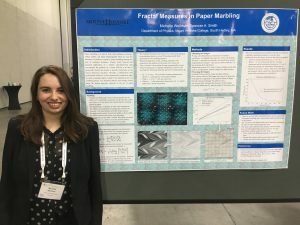 This project also led me to the APS Division of Fluid Dynamics Conference which took place in Atlanta Georgia in November 2018. At this conference, I presented my poster at the technical poster session, and attended some talks on various applications of fluid dynamics. 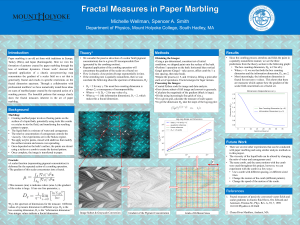 The poster I have shared below goes over some background information on paper marbling as well as fractals, and discusses the theory behind the project, which was inspired by a paper cited in the poster. It also outlines the processes we used to create the marbling images, and process those images using a program written in Python. Finally, we discuss the results of the project as well as future work. Back in the summer of 2017, I participated in research in a physics lab for the first time. That summer I worked with Professor Alexi Arango in his lab at Mount Holyoke College, where we attempt to create devices that generate electricity using solar energy. The ultimate goal of the lab is to construct efficient tandem cells, which would lead to large-area, lightweight, flexible solar cells. Participating in the research in his lab was a lot of fun, and an excellent first experience in a physics lab. It was also very rewarding, since it contributes to the increasingly important task of eliminating greenhouse gas emissions. The summer I was working there we focused on experimenting with lead-sulfide (PbS) quantum dots as an absorption layer for the devices we constructed. Quantum dots are basically very small semiconductor particles that are only several nano-meters in diameter. Lead-sulfide quantum dots are an attractive material for creating solar cells, particularly because they have a low fabrication cost. Throughout the summer, I worked with a few other students to familiarize ourselves with the process of creating PbS quantum dot solar cells, taking part in experiments on the each of the different steps in fabricating these solar cells, collecting data on absorption, open-circuit voltage, and efficiency, and understanding what the data we collected was telling us about these devices. By the end of the summer, all of us had chosen a part of the fabrication process of these solar cells to conduct our own experiment on, and present our findings as a research poster. The part of the process I chose to focus on was the ligand exchange treatment for the PbS absorption layer of the cells. The goal of my experiment was to try out a different chemical for the ligand exchange treatment in the cells than the one we had been using for most of the summer. 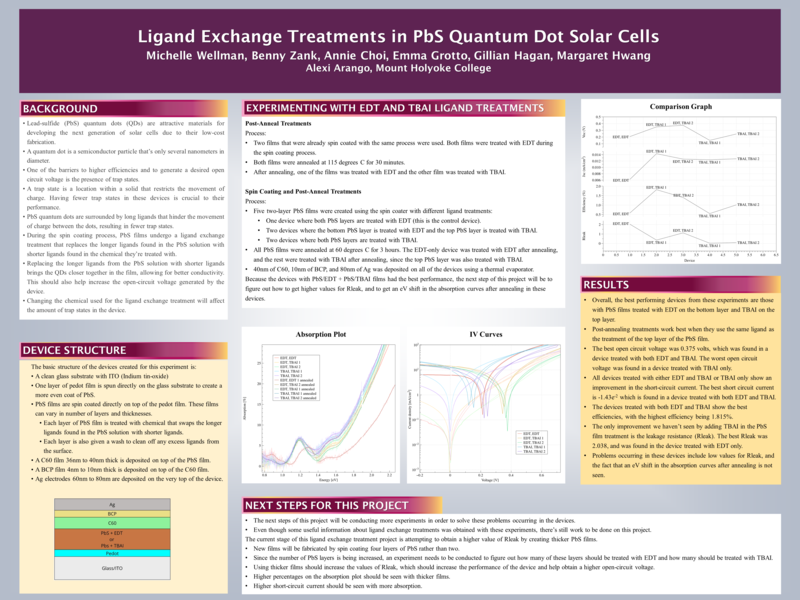 The poster I have shared below details the role that the ligand exchange treatment plays in the function of the solar cell, the purpose of conducting this experiment, and the results of the experiment. I presented this poster at the Mount Holyoke College SPS Summer Research Poster Session in October 2017. During the Fall 2018 semester, I took a course titled “Statistical Mechanics” at Mount Holyoke College, taught by Kerstin Nordstrom. This was an 300-level course that focuses on concepts in thermodynamics and statistical mechanics. Nearly all of our time in class was spent on lectures, where we discuss the fundamental concepts in statistical mechanics and solve some complex problems as a class. Towards the end of the semester, we were assigned to come up with a project to do independently that further explores one of the topics we discussed in class. I was inspired by the lecture on quantum gases, which mentioned white dwarfs as an application of the Fermi gas, an example of a quantum ideal gas. Seeing this as an opportunity to merge my interests in physics and astronomy, I decided to do my project on white dwarfs, where I completed a problem that derives the relationship between the mass and the radius of a white dwarf star. The relationship between mass and radius is directly derived from the function for the total energy of the white dwarf. The function for total energy incorporates the Fermi Energy, which is an important property of a quantum gas. 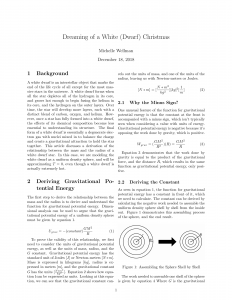 This article walks through the derivation of the relationship between the mass and the radius of a white dwarf. It includes a detailed description of the process, as well as the equations used, calculations done, and some figures I created. Figure 1 in the article, the sketch showing the assembly of a sphere shell by shell was created in Adobe Illustrator, and Figures 2 and 3 in the article are graphs generated by Wolfram Mathematica. During the Fall 2018 semester, I took a course titled “Electronics” at Mount Holyoke College, which was taught by Kathy Aidala. A lot of physics majors take this course in order to fulfill part of the lab requirement for the major. Most of our time in class was spent working on labs that reinforce the concepts in analog electronics that we learn by reading, solving problems for homework, and discussing in a lecture before the lab. The labs we do in class have us building and testing analog circuits that serve a variety of purposes. 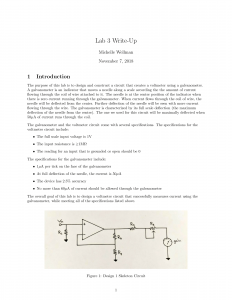 The lab I’m sharing in this post is the third lab in the class, and the first one we were assigned to do a write-up on. In this lab, we designed, built, and tested two different circuits, both of which function as a voltmeter. Both of the circuits we built had some parameters that we were required to meet with the design. Before we began, we were given skeleton circuits for both voltmeter circuit designs, meaning that we already had a basic layout of what the circuits should look like. The part of the design that we were tasked with figuring out was what we should use for the specific components of the circuit, such as the values of the resistors, and the model of the op-amp. All of the decisions on these components were made in order to meet the parameters we were given for the circuits. Once we decided on these specifications and had a complete design, we built and tested both of the circuits. This write-up discusses the specific tasks we were required to do in this lab, and walks through the entire designing, building, and testing process. All circuit designs and drawings, as well as the calculations done to find resistor values are included in the document. The final document was written in LaTeX, and all of the figures were hand-drawn by me. January 2019 has begun, which means that I am currently in the middle of winter break, the month in between the fall and spring semesters with little stress and few worries. Or at least it’s advertised to be that way. As a senior physics major with her sights set on graduate school, this “break” isn’t much of a break for me, but is rather an amount of time allotted for me to begin my preparations for applying to graduate school. One of the things that most students have to do in order to be accepted in to graduate school is to take the Graduate Record Examinations, or the GRE. I have never had a very good history with standardized tests, so needless to say I am not excited to take this exam. However, the time I have for winter break allows me to begin my preparations for the GRE, and do what I can to feel as confident as possible when I take the exam. I will be taking both the General GRE, and the Physics GRE (since those are the ones required by most graduate programs in physics), so those are the two exams that I will be spending my time preparing for. Above is my roadmap for studying for the General GRE test. As shown, it has three major parts: Analytic Writing, Verbal Reasoning, and Quantitative Reasoning. The Analytic Writing section has two tasks: one that has the student write a short essay analyzing a given issue, and the other one has the student write a short essay analyzing a given argument. For each task in the analytic writing section, my intention is to first understand what specifically is expected to be done when given a prompt, and how a submission for the task is scored. Next I want to look at some samples from past GRE tests, and understand why they received the score that they did. Finally, I’ll spend some time practicing these two tasks using the materials I’ve gathered. The verbal reasoning section of the test has three parts: Reading Comprehension, Text Completion, and Sentence Equivalence. 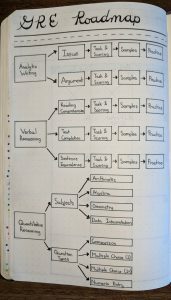 My plan of approach for this section is similar to my plan for the analytic writing section, where I spend some time understanding the task of each part and how they’re being scored, look at some samples from past exams, and then practice. The quantitative reasoning section of the test is a little different from the other two. This section contains four different question types (comparison, multiple choice (select one), multiple choice (select one or more), and numeric entry), and covers four different areas in math (arithmetic, algebra, geometry, and data interpretation). 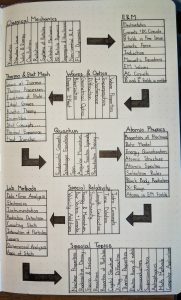 I’ve laid out my approach to this section a little differently, where I spend some time familiarizing myself with both the subjects covered, and the types of questions being posed, and then complete plenty of practice questions with the goal of being able to answer them as efficiently and accurately as possible. Above is my roadmap for studying for the Physics Subject Test. This test covers nine major areas in physics (classical mechanics, electromagnetism, waves and optics, thermodynamics and statistical mechanics, quantum mechanics, atomic physics, special relativity, lab methods, and special topics), each of which cover a wide range of more specific topics and concepts. This roadmap is a complete breakdown of all of the topics on the physics subject test, where the large boxes represent each of the major subjects covered, and are further divided to represent the more specific topics. My plan of action for this subject test is to familiarize myself with each of these topics, and answer a bunch of practice questions with the goal of being able to complete these questions as efficiently and accurately as possible. This roadmap makes the volume of material on this test seem very high, which is true, however there are some topics that appear way more often than others. For example, classical mechanics and electromagnetism appear on the test the most, and lab methods and special relativity appear on the test less. Therefore, my studying will be prioritized based on how much each subject is seen on the test. I hope that reading my blog posts on the GRE will help those who plan on taking the test in the future, and remind those who are studying for it and taking it are not along with their suffering. I’ll make sure to keep posting updates on my progress! Hello everyone, happy 2019, and welcome to the first post on my brand new website! 2019 is the year that I graduate from Mount Holyoke College with a bachelor’s in physics and astronomy, so it goes without saying that this is a big year for me. 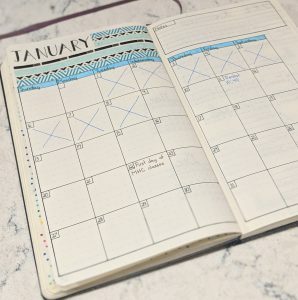 With this major life event quickly approaching, there are some things that I want to do and goals that I want to set for myself in order to feel more ready for my post-college life, and to improve myself as a person. At the time that I am writing this blog post, I do not have any immediate post-graduation plans, however the life goal I currently have that will become my main focus for the year is to get in to graduate school in order to pursue a PhD in physics. My purpose for getting a PhD is to gain the ability to achieve my goal of becoming a physics professor, a career that would allow me to conduct research as well as educate the next generation of physicists. Above are the first two pages I have for the new year. 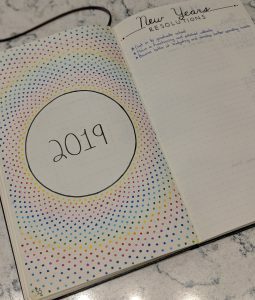 On the left I made a colorful title page to bookmark the beginning of 2019, and on the right I have a page for my goals and resolutions for the year. I’m pretty happy with how the title page came out, however I didn’t really plan it out before starting it, and I wish that I made the center circle a little smaller to have more room for the colors. The image above shows what my future log for 2019 looks like. 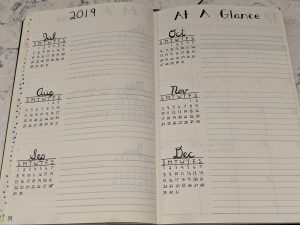 On the left of the pages I have miniature calendars for every month where the important dates will be highlighted, and the right of the pages has space for writing the descriptions of the important dates. The pages for the first half of the year are plagued with ink smudges, so I’m showing the second half since it looks a lot nicer. Above is the monthly page for January, the first one of 2019. My monthly pages have recently been looking like this, with the calendar taking up most of the space and being the center piece, and some space at the top right for notes. One thing I like to do is assign a color for each month, which is used on the calendar, as well as all of the weekly pages for that month. January has been assigned light blue. On the far right side of the page, I have a little bit of blank space which isn’t being used for anything yet. There’s not a lot of space there, so for this month I probably won’t do much more than adding some extra decorations. However, I may increase the size of the space in order to include something else on my monthly pages if I feel that there’s something missing. Another goal that I have for the coming year is to put a considerable amount of work into this website, and to have it functioning and polished by the end of the year. This website will hopefully serve a couple of purposes. One purpose is to document and track the progress made on my other goals. Another purpose of this site is to explore some of my interests in science, and to enhance my communications skills. My hope is that by becoming a better communicator in physics and science, I will be able to teach the students of these areas more successfully, and feel more confident when I begin my role as an educator. I hope that everyone has had a great start to the new year, and remember to check back on this website for more posts! This is a photo of me at the APS DFD Conference in November 2018, standing in front of the poster I presented.